“PonderUp” is a pleasant game that helps children practice the comparison of numbers and/or quantities i.e. “find the greater” and “find the lesser” or “find the odd” and “find the even”. The child sees two bubbles that contain numbers and/or quantities and/or math operations that should be compared. The child, i.e. 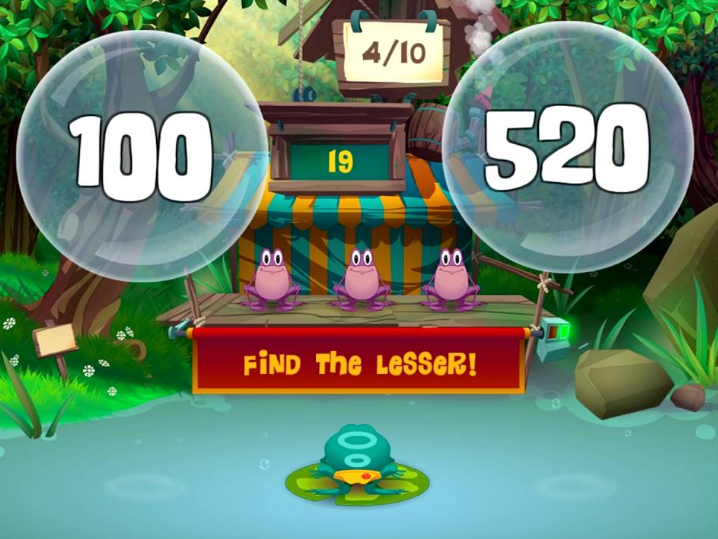 the little frog, has to move left or right, stand under the bubble with the correct answer, and jump to break it. The messages “Find the greatest”, “Find the less” or “Find the odd”, “Find the even” or “Get in the middle” give instructions to the child for making movements accordingly. The child becomes a little frog in a lake that makes side movements in an effort to choose the correct answer at a given question.